You know that exercise is a must if you're trying to burn fat and lose weight and you also know that cardio is a big part of making that happen. The great thing about cardio is that there are so many choices. The ability to do different activities at varying levels of intensity means you have a multitude of ways to get your heart rate up and burn calories. One of those is high intensity interval training (HIIT). HIIT workouts have been proven to help your body burn more calories in less time. Even better, if you work hard enough, you get a great afterburn. Your body burns even more calories after the workout to get your system back to normal. Another great benefit of HIIT training is that there are so many ways to do it, you could do a different HIIT workout every week and never repeat the same one. HIIT workouts are designed to push your limits, getting you well out of your comfort zone for short periods of time. When setting up HIIT workouts, your focus should be on four important things: Duration, intensity, frequency and the length of the recovery interval. Generally, the work interval should be anywhere between 5 seconds to 8 minutes at an intensity that's 80 percent to 95 percent of your maximum heart rate if you're using target heart rate zones, or about a Level 9-10 on this Perceived Exertion Chart also known as your rate of perceived exertion (RPE). How long you rest between intervals depends on your fitness level and goals. An advanced exerciser who wants a challenge might have a 2:1 work to rest ratio. That means the rest is shorter than the work set—such as doing a 1-minute sprint followed by a 30-second rest. For a less intense workout, the ratio might be 1:2, working hard for 30 seconds, followed by 1 minute of rest. You can also keep the rest intervals the same as the work intervals. With all that in mind, there are 5 different HIIT workouts below that fit any exerciser. But, before you start, you'll want to keep a few things in mind. While the benefits of HIIT training are many, there are some drawbacks of this kind of training. Working at a high level of intensity is uncomfortable, especially for beginners, and doing high impact, high intensity exercises, like some of the plyometrics shown in the workouts, can cause injury if your body isn't ready for them. Thoroughly warm-up before the workout. This will help get your mind and body ready for the workout and to help protect against injury. Monitor your intensity. The idea is to work as hard as you can for the suggested intervals. It's normal to be breathless and some intervals build on each other so that, by the end, your body craves oxygen. If you feel it's too much, take extra recovery time. After some practice, you'll know how far you can push your body. Skip any moves that cause pain or discomfort. Feel free to substitute exercises if some don't work for you. Only do HIIT workouts 1-2 times a week to avoid overtraining, injury, or burnout. End with a cool down and a stretch. The first HIIT workout is for you if you want a lower impact version of interval training. There's no jumping here, so choose this one if you want to ease into HIIT training with a more moderate level of intensity. Warm up with at least 5 minutes of cardio. Do each exercise for up to 60 seconds. 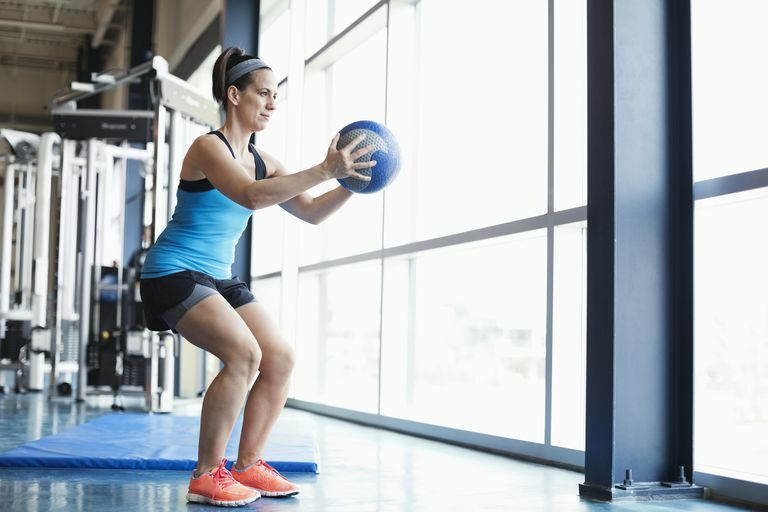 Increase the intensity by using a heavier medicine ball, increasing your range of motion or, if you like, adding a jump to the exercises. Rest for longer periods if you feel too uncomfortable. go over as you step out and over as you step back. If you want something short and intense, Tabata Training is a great choice. In just 20 minutes, you can hit all of your energy systems, including your aerobic system and your anaerobic system . By working as hard as you can for short intervals, you build an oxygen debt that requires your body to burn more calories to recover. For Tabata Training, choose a high intensity exercise and do it for 20 seconds. Rest for 10 and then repeat the same move or do a different move. You repeat this eight times for a total of 4 minutes. To make your workouts easier, try a timer like this Tabata Pro App. For each Tabata, you'll alternate two different exercises, doing each for 20 seconds and then resting for 10 seconds. The intensity is cumulative, so you'll find it gets harder as you get to the end of the Tabata. That's normal, but if you feel too winded, feel free to take a longer rest. Walk around or march in place to recover between each Tabata and end with a cool-down and stretch. Another way to turn Tabata Training into something new is to switch the intervals. In this 40/20 workout, you choose a high intensity exercise and do it for 40 seconds, resting for 20. You repeat that, either doing the same exercise or a different one for 4 total minutes. In this workout, once again you'll alternate exercises for each block. That makes the workout a little more interesting instead of having the monotony of one exercise. Feel free to substitute exercises if these don't work for you. Do each exercise for 40 seconds, resting for 20 seconds. Take 1 minute of active rest between blocks, more if you need to. Skip any exercises that cause pain or discomfort. Be sure to end with a cool down and stretch. While the previous workouts were all cardio, another way to bump up the intensity while getting a total body workout is with high intensity circuit training. With this workout, you'll do a series of compound strength exercises designed to work multiple muscle groups while keeping the heart rate elevated. Various dumbbells, a kettlebell (you can use a dumbbell if you don't have a kettlebell). Start with a warm up and then move through the exercises, one after the other, with very short rests in between. The idea is to keep the heart rate elevated by shortening the rest periods, but take extra time if you feel too breathless. Do each move for 30-60 seconds and end with a cool-down stretch. Last but not least is the simplest workout, a body weight workout where don't need much space or equipment. Add more range of motion. The bigger the movement, the more intense it is. So, say you're doing the Line Tap exercise below. To make it more intense, squat as low as you can. Add bigger arm movements. Arm movements, like giant circles or lifting them overhead, can contribute quite a bit of intensity to any exercise. Add high impact movements. Another way to make things harder is to add a jump to the exercises. For example, when you're doing Knee Smashes or Standing Crossover Crunches, add a jump to increase intensity. Warm up and then do each exercise one after the other with very short rests in between. Do each move for 30-60 seconds, skipping any exercise that causes pain or discomfort. Repeat the circuit once or as many times as you like, ending with a cool down and stretch.